Peter Davison and Mark Strickson return in October for our latest Doctor Who Main Range anthology! The Doctor Who Main Range brings you a new full-cast adventure every month, starring one of the original actors to play the Doctor on television! Featuring fantastic new creations or the best-loved monsters from the series' past, these stories are perfect for Doctor Who fans young and old. 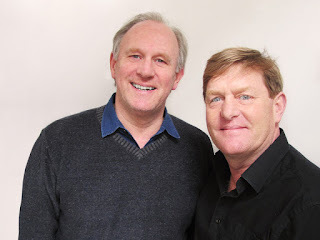 October's Main Range release will form an anthology of four stories, each featuring Peter Davison as the Fifth Doctor and Mark Strickson as his alien schoolboy companion Turlough. The Doctor and Turlough arrive on a planet where to be forgotten is to cease to exist. But the Forgotten leave a gap in the world – and that’s where the monsters are hiding. Deep in the heart of old Europe, the village of Vadhoc awaits the coming of a mythical teller of magical tales – but not all such stories end happily, the TARDIS travellers discover. The Doctor has tracked the deadly Bratanian Shroud to 22nd century Reykjavík – where he’s about to become the victim of a serial criminal. Again. A young woman climbs a perilous mountain in search of her destiny. The Doctor and Turlough save her from the monsters on her trail – but what awaits them in the Cavern of Becoming is stranger, even, than the ravening Hungerers outside. The release will be Peter and Mark's first Big Finish appearance as a pair since 2005's Doctor Who: Singularity. Also appearing are Suzann McLean, Ian Brooker, Mandi Symonds, Duncan Wisbey and Kae Alexander. All four stories are directed by long term Big Finish associate Helen Goldwyn. Peter Davison will also appear in January 2017's Doctor Who: The Star Men. More details will be coming soon!